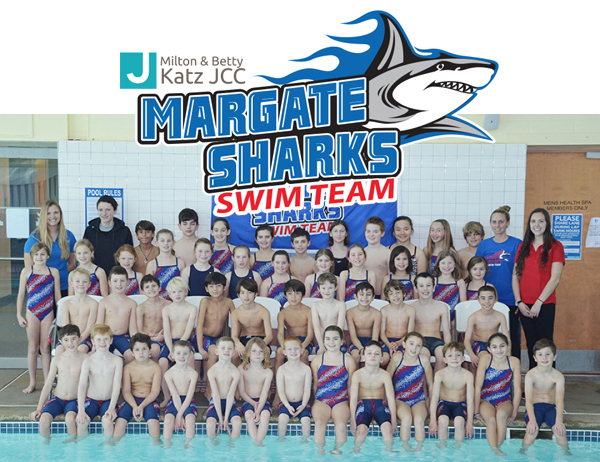 The Margate Sharks competitive swimming team has become one of the growing programs in the area. Since 2014, the team has grown steadily and has made its mark at different levels of swimming, such as Silver Champs and Junior Olympics. The team competes in both Dual and USA Swimming meets during the season. USA participation is encouraged but is optional depending upon the level of the swimmer. The team is a registered USA club and participates in USA meets whenever possible. The program begins practice in early September and runs through the end of January/Mid-February. Dual meets and Championships are swum during this time. Swimmers may extend their season into February/March by qualifying for the Bronze Champs, Silver Champs or Junior Olympics. During the winter, stroke clinics will be held on Fridays following practice from 5-6PM. In the spring, additional programs are available for swimmers who want to focus on training for the next level of swimming. Over the summer, the JCC also competes in a summer league with Dual meets offered on week day evenings – meets starting Mid-June thru the end of July. Greater South Jersey Swim League: The Sharks program operates one team in the GSJ Swim League with 3-5 dual meets each season. Everyone is eligible to compete in championships as long as you swim in 2 dual meets. Dual Meets start in mid November and run thru Mid-January. League Champs will take place between the end of January thru the beginning of February. Bronze Championships: Is a USA meet held at North Penn High School in PA. This is an opportunity for the bronze level swimmers to compete in a large championship style meet and possibly achieve Silver Champ qualifying times. This meet is qualified by time and has over 25 teams and 800+ swimmers at the meet. This meet is usually the second weekend in March. Silver Championship: Is a USA meet held at Gloucester County Institute of Technology in Sewell, NJ. This is an opportunity for the silver level swimmers to compete in a large championship style meet. This meet is qualified by time and has over 25 teams and 1,000 athletes attending. This meet is usually the last two weekends in March, Friday-Sunday. Junior Olympics: Is a USA meet held at York, YMCA in York, PA from teams involved in the Middle Atlantic Region. The Sharks had its first J.O.’s qualifier in 2015. This meet takes place in the beginning of March, Thursday-Sunday. New Jersey States: Is a USA meet held at Gloucester County Institute of Technology in Sewell, NJ, with teams across the entire state. The Sharks continue to place in finals in team competition. This meet takes place in the beginning of December. Practice group and current season rates determine fees. Spring and summer programs are additional.